Like some of the classic Alfred Hitchcock movies, Vertigo changes direction and plot point repeatedly. It sets up the vertigo of the title quickly, with James Stewart’s Scottie almost falling to death in a chase of a criminal. From then on the characters fear of heights seems to play only a minor part in the movie until Hitchcock pulls the rug from the under the audience. 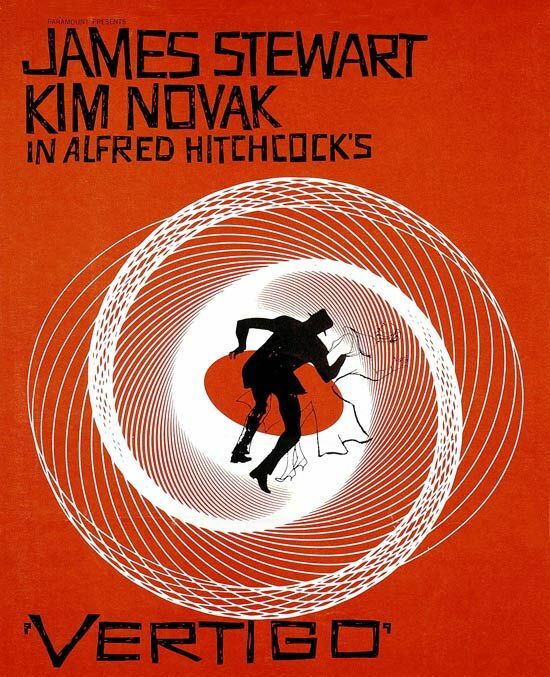 To describe the plot of Vertigo, it would feel more like a supernatural mystery. Stewart is asked to follow a man’s wife, using his previous detective skills, and discover whether she is being possessed by a deceased ancestor. The woman he follows acts strangely, seemingly challenging the woman and eventually he falls in love with her. What follows is a twisted mystery, as Stewart is forced further into a conspiracy, unsure to what is going on and making key discoveries of what the story really is when the audience do. Vertigo is a perfect example of Hitchcock’s mastery with storytelling. He relies on the audience to follow the clues and trusts the audience to keep-up. There is no spoon-feeding of information and because if this, some of the key moments will confuse and confound, making the movie even more compelling. It also helps that he has such a captivating pair of leads. James Stewart is a classic actor, managing to play the goofball, the romantic lead and the obsessed man. What Hitchcock requires the actor to here really tests his range he handles it ably. The same can be said for the woman he loves, Madeleine, played by Kim Novak. She has slightly more to accomplish here and has to juggle two performances in the course of the film’s events. Hitchcock handles the actors and the different story strands well though. He also manages to mix-up the visuals too. The movie is called Vertigo and his representation of that dizzying feeling vertigo gives a person is a well-known effect. 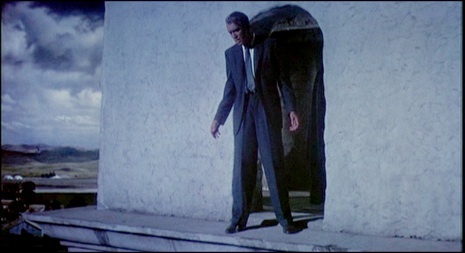 The chase up the bell tower, with Stewart experiencing the sensation repeatedly, is a stand-out in the movie. As is the scene where the events of the movie and the vertigo of the title catch-up with Stewart. The bizarre visuals, a mix of animation, camera trickery and weirdly staged scenes make for a disorientating but effective look at a man losing his mind. With all this great set-up for the movie and a captivating story throughout, it is a shame that the finale of the movie seems slightly rushed and sudden. Although not written by Hitchcock, it does feel like the script wrote itself into a corner, not sure how to really end the twisted tale. The classic Hitchcock twist to end the movie and tie-up the story doesn’t ring true here and is staged poorly, surprisingly for such a precise director. Overall, Vertigo is an example of a classic Hitchcock movie that is difficult to describe and keep-up with. Hitchcock uses all the tricks in the book to keep the story compelling, from great actors, a twisted mystery and some innovative use of the camera. It is shame the finale can’t quite match the magic of what has gone before it. One of my favourite Hitchcock movies! Previous Previous post: Hitchcock Week: The Launch!